Racing is always an exciting action. There are adrenaline, excitement, and speed. What could be better than fighting against rivals in a dynamic race on the highway? Legendary car games are coming back! Initiative team of developers, who created car games Car Eats Car and Car Eats Car 2, presents the new free 3D part of action arcade. Young racer has to drive uphill and downhill, fight against police and civil vehicles, climb the mountain, like real climbers and conquer the road. What is more, it works in offline mode, so you could enjoy it whenever you want. All about the free crash game for kidsThis game provides an even stronger impetus for forging ahead. In this part of the exciting car games, driver has to take control on the evil red car’s wheel and have many more adventures to the neighboring town. The trip is complicated with pleasant and unpleasant events on the highway. The rivals try to attack your car, knock it down and destroy it totally. The main rivals goal is to prevent gamer from gaining bonuses and coins. Coins are the way to improve car’s characteristics. The main driver’s goal – fighting, jumping uphill and winning the race. But remember, it’s a madness race, so good luck. Dynamic gameplayThis offline application is the number one for kids all around the world. Creators offer dozens of content actions and player will find it hard to stop racing. Driver can upgrade his racing car and common characteristics by adding steel armor, new wheels, powerful speed and other special abilities. Your energy and initiative drive development, literally. Let’s climb the hill of racing life together. What we have for you:●	Speed boost;●	Gravity boost;●	Bombing stuff and others.There are different riding advantages just for fun and for free. These additions are like advantages over enemies and opportunities to crash them. Collect them as much as possible and fight bad guys easier. Let’s avoid the crash and stay brave. Help your friends to stay out of prison. We wish you success in these quests ahead.The target audienceActually, it’s an optimal illustration of car games for boys. But who cares? If a girl likes either active games or even car games, where she is jumping, riding and racing, it will be the best offline race of her life. 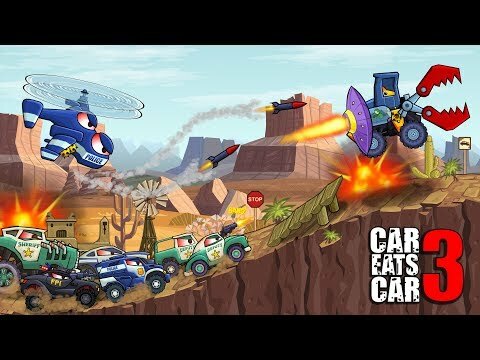 The main features:●	🏆 New hot opportunities – to drive in evil car and battle with police and civil rivals;●	🚗 New cars – unlock and upgrade new vehicles and drones;●	🛠️ Tools – collect coins and improve car’s characteristics and skills, like speed, damage, and turbo-mode;●	💥 Objects – crash enemies with the aid of missile launcher, freeze ray, magnet, bomb generator and EMP emitter;●	💣 Bomb-stuff – go off your bombs to destroy bad guys by powerful devices;●	🎯 Missions – deal with hard tasks;●	⛰️ Maps – explore new locations and objects, like hill, mountain or highway;●	💗 Communication – make friends and add them to the hot adventures;●	🏅🏆 Tournament – achieve your goal and become the first one on the highway.Just imagine – tough guys get behind the wheels of incredibly tricked-out cars, drive fast and win the dynamic race ever. Do you want to be that tough guy? Or be like brave climbers, but instead of a mountain, you have the highway? Download for free the best in the world offline car games and try to be the first! FeedbackYour opinion is valuable for us to deliver the best service for kids. It would be a pleasure for us to have the space to describe our services. Please, report us if something went wrong. We are looking forward to your getting your response in order to fix any bugs or improve app at all. The team follows up on the quality of the application.Faster, better, stronger – these are 3 tips for a new car battle app for kids. Let’s play an awesome race on your smartphone!